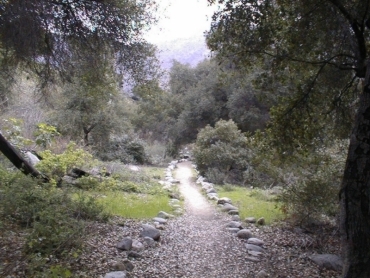 This is a looping trail about one-quarter of a mile long. It begins at the work yard, approximately 100 yards north of the Nature Center, at the base of the bluff on which private homes are situated. 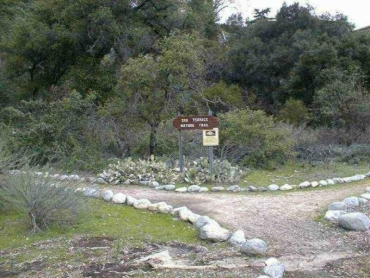 There are numbered marker posts along the trail which can be used as reference points. Click here to print a trail guide or you may pick up a complimentary copy in the Nature Center and take it with you. It will give you information about what you might expect to see at each stop. Plants along the way include coast live oak, poison oak, white nightshade, white sage, black sage, coffeeberry, laurel sumac, yucca, dodder, toyon, sycamore, horehound, and elderberry. You may also see various rocks, birds, squirrels, rabbits, lizards, snakes and insects. Take photos, memories, and trash away with you, but nothing else - no plants, animals, sticks, stones, or leaves. Enjoy your visit and allow others to enjoy theirs.